Our singers have been hard at work learning their songs for tomorrow’s municipal Remembrance Day ceremony here in Whistler. Through the efforts of local citizens, our cenotaph has been moved from the village fire hall to a more accessible site in Olympic Plaza. This will be our first year at the new site so we took a short ‘field trip’ a few weeks ago during choir practice to visit the site and sing our songs there. This year’s ceremony will also be the first time that the bilingual version of O Canada will be sung as part of our ceremony. If you’re in Whistler on Saturday, November 11th, our Remembrance Day ceremony begins at 10:30am at the cenotaph in Olympic Plaza (by the flags). Come and join the Whistler Children’s Chorus and the Whistler Singers as we honour those brave men and women who have served our country. As we get ready to start the 25th season of the Whistler Children’s Chorus we’d like to thank two organizations whose grants help make choir possible. 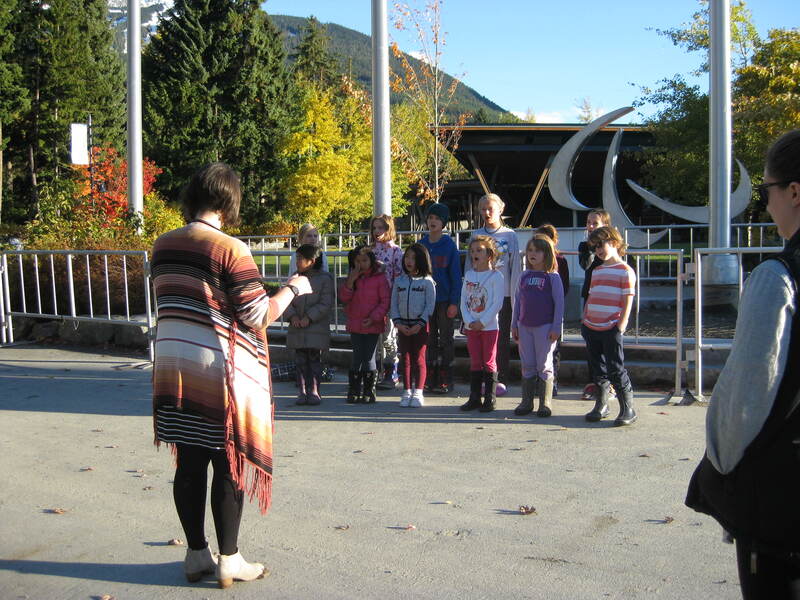 In 2017 the Whistler Children’s Chorus was a recipient of the Resort Municipality of Whistler’s Community Enrichment Program grant. Funding from this grant is instrumental in allowing the choir to remain sustainable and to keep the choir fees manageable and this activity accessible to all. The choir has received funding from this grant from 2011 to 2017. The WCC has also been the recipient of grants from Arts Whistler in 2015, 2016 and 2017. This grant has allowed us to bring in clinicians to work with the choir and to participate in music festivals such as the Kiwanis Music Festival and the Howe Sound Music Festival. Ready to sing? Come join us for the 2017/2018 season. Register Now! Registration for the 2017/2018 Season is Now Open! Whistler Children’s Chorus has a lot of sing about! Our 2017 – 2018 season is about to begin and this year we’re celebrating twenty-five years of making music in Whistler. Registration is now open. You may register online or pick up a registration brochure from the Whistler Public Library, Maury Young Centre for the Arts or at any of the Whistler elementary schools. Rehearsals are on Tuesdays – Junior choir (ages 6 to 8) from 4 to 5 pm & Intermediate choir (ages 9 to 13) from 4:30 to 5:30 pm. We rehearse at the Maury Young Arts Centre (formerly Millennium Place) in Whistler village. Our 2017 – 2018 season begins with preparations for BC Culture Days at the end of September and the municipal Remembrance Day ceremony in early November. Then it’s Christmas and winter songs galore! On December 10th, we will be presenting A Classical Christmas– a Christmas pageant complete with costumes, narrators, props, music instruments and lots of singing. We’ll be carolling during the holiday season and, of course, hosting the 34th annual Christmas Eve Carol Service. 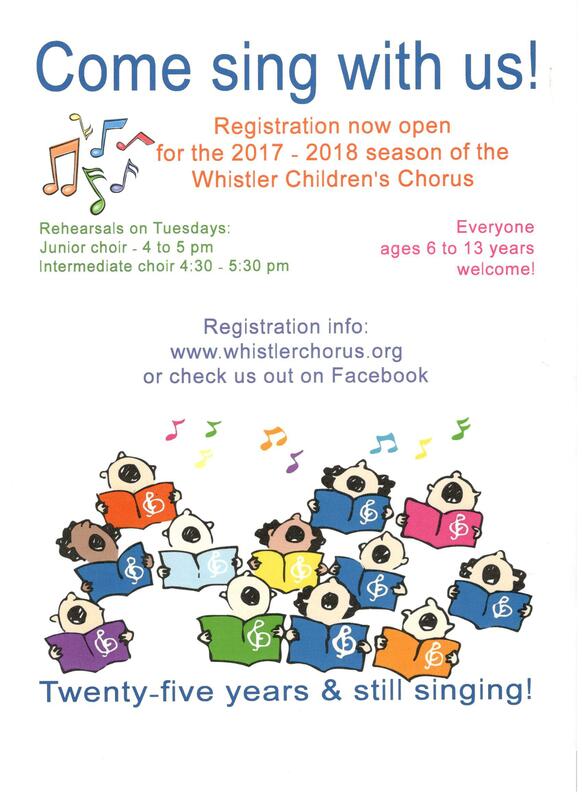 The Whistler Children’s Chorus is a non-auditioned community choir for children and youth. Everyone is welcome! 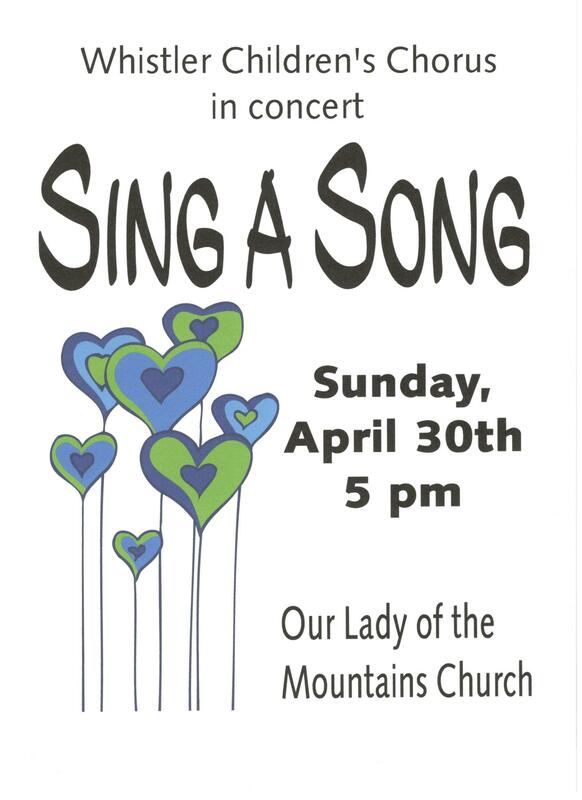 Join us Sunday, April 30th, at 5:00pm at Our Lady of the Mountains Catholic Church for the Whistler Children’s Chorus annual spring concert. As always, admission is free to all. Come and hear our singers as they share their love of music. Although it hasn’t begun to snow yet, the choirs are busy preparing music for the upcoming holiday season. With caroling events beginning next weekend (November 25th), we can’t be too prepared! Check out our events page to see where to find the choirs over the weeks leading up to Christmas. Don’t forget to mark December 11th on your calendars. Our annual concert to benefit the Whistler Food Bank will be at Our Lady of the Mountains Church on Sunday, December 11th at 5 pm. A Christmas Tale will feature songs that tell a story with some new – A Porcupine in a Pine Tree – as well as some annual favourites – Six White Boomers. Admission is by donation to the Whistler Food Bank so come join us for some holiday cheer. 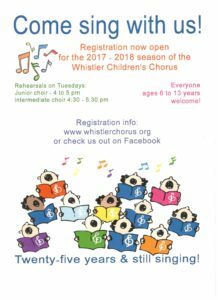 Currently in our 26th year, the Whistler Children’s Chorus is an non-auditioned community choir for youths and children in the Whistler area.